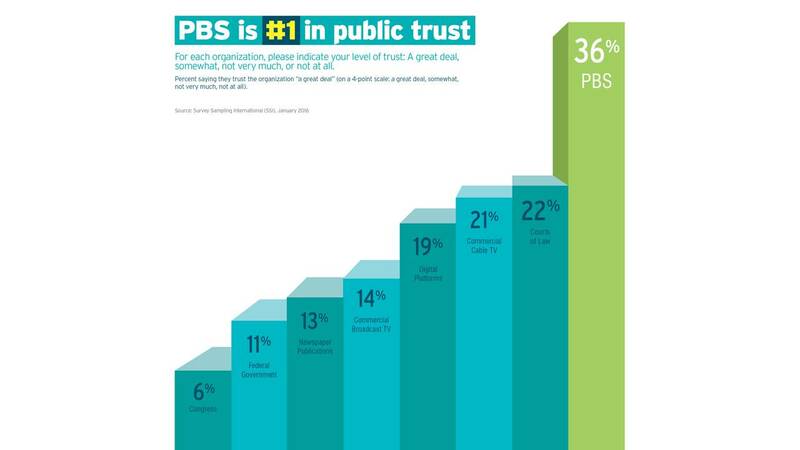 ARLINGTON, VA – February 18, 2016 – A nationwide study recently confirmed that PBS and its member stations are rated #1 in public trust among nationally known institutions, and are called an “excellent” use of tax dollars by the American public for the 13th year in a row. 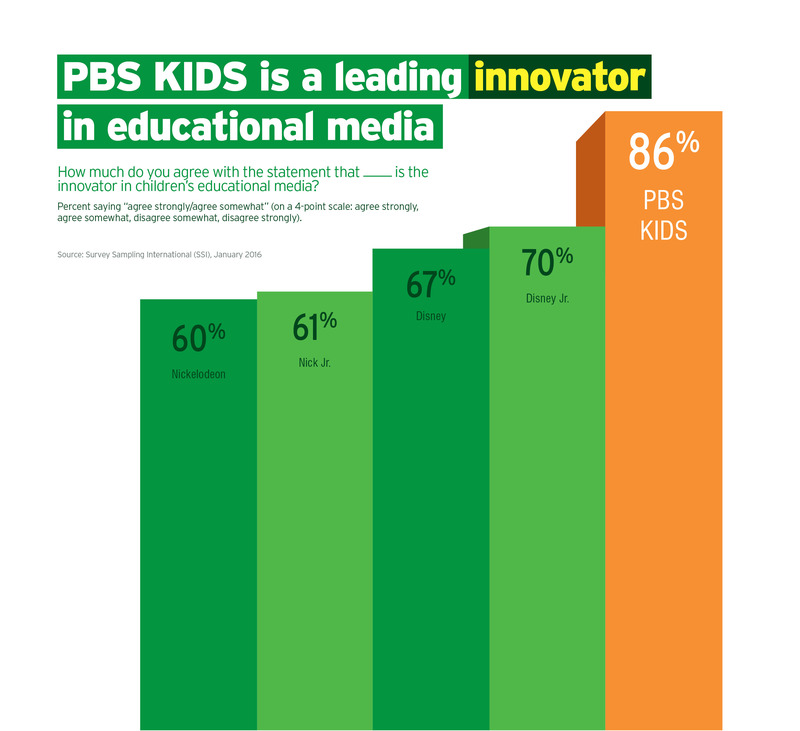 Results also confirm that the American public ranks PBS KIDS the #1 education brand, the top provider of content that “helps prepare children for success in school and life,” the safest media destination, as well as a leading innovator in educational media and more. The national poll was created by the research team at PBS and was conducted by telephone in January 2016 by Survey Sampling International (SSI). 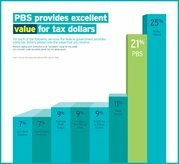 Each year, PBS commissions research to measure its performance and value as judged by its most important stakeholder – the American people. 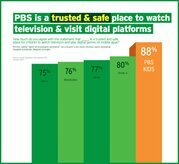 Nearly 8 in 10 people trust PBS (79% “trust a great deal” or “trust somewhat”). 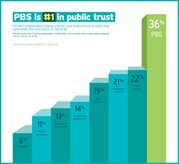 The 2016 study marks the 13th time in a row that PBS was called the nation’s most-trusted institution among a consideration set that includes courts of law, commercial cable and broadcast television, newspapers and others. 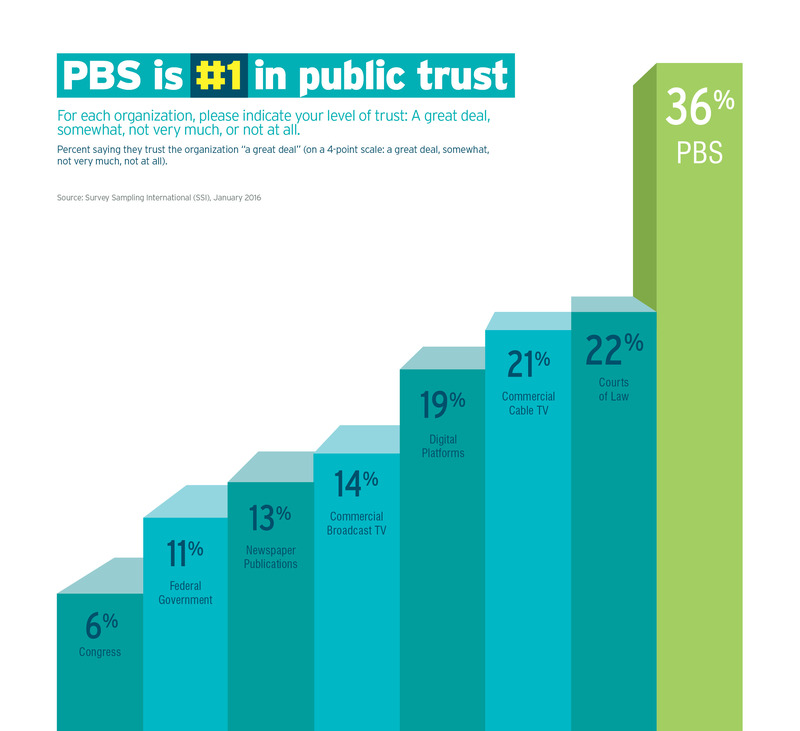 The study found that more than 1 out of 3 participants (36%) trust PBS “a great deal,” significantly outscoring the nearest institution, courts of law (22% “trust a great deal”). 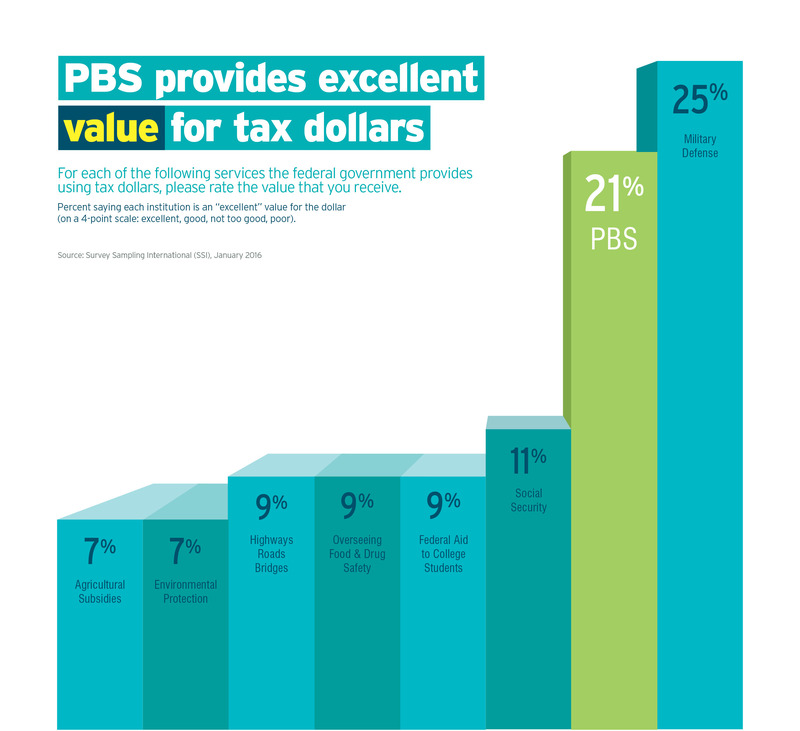 - Only military defense outranked PBS as the best value for the American tax dollar. 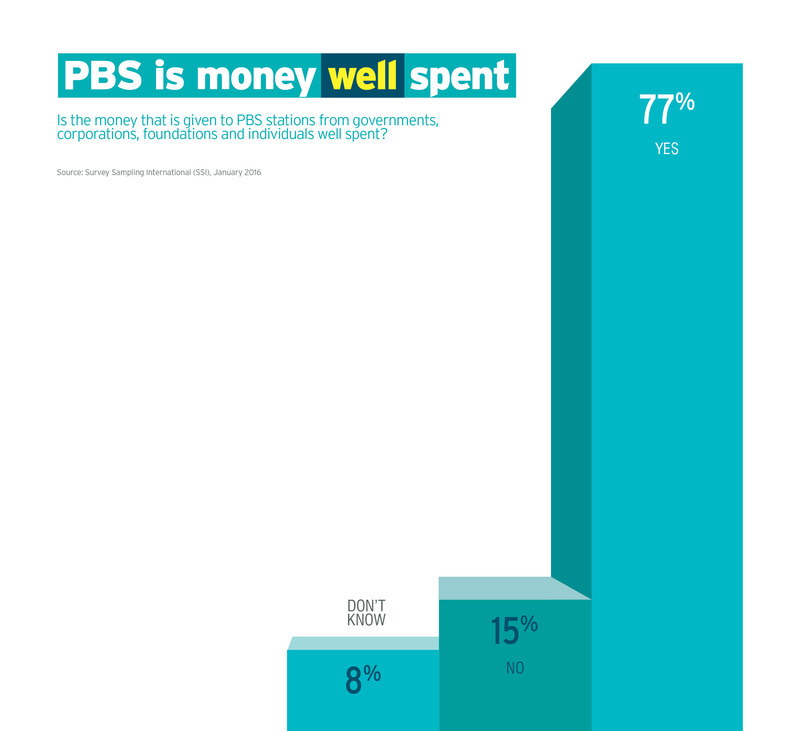 Nearly three quarters (72%) of those polled called PBS an “excellent” (21%) or “good” (51%) use of their tax dollars. Military defense was described as “excellent” or “good” by 73% (25% “excellent” or 48% “good”). 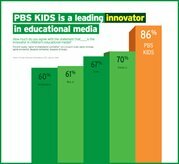 PBS KIDS was ranked #1 as the most educational media brand compared to a range of other television networks. 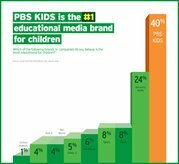 - Forty percent (40%) of respondents named PBS KIDS the most educational media brand, significantly outscoring the second most highly rated kids brand, Discovery Family, which was considered most educational by 24%. Disney and Disney Jr. were called most educational by 8% and 5% of respondents, respectively. 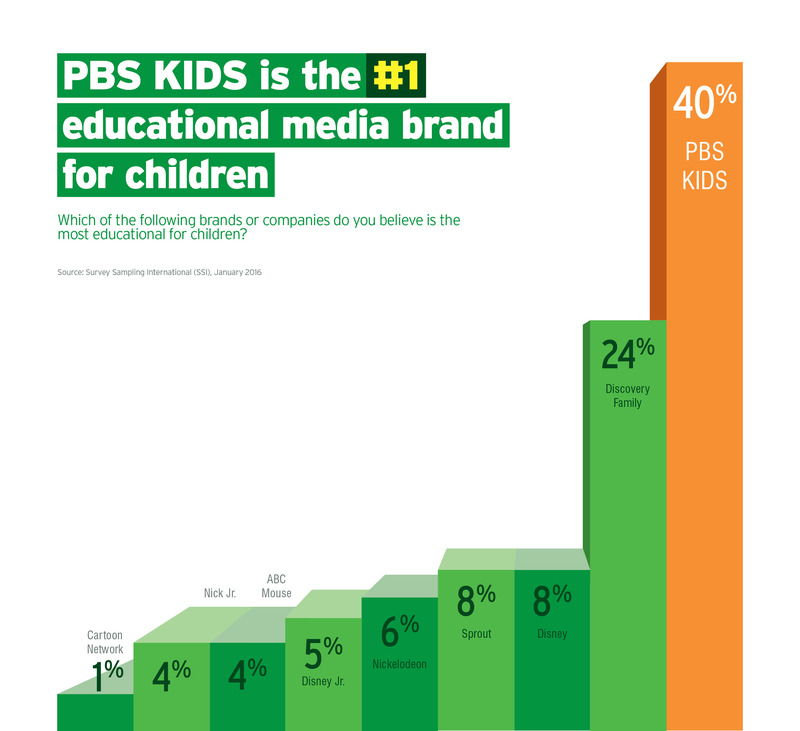 Nickelodeon and Nick Jr. were called most educational by 6% and 4% of participants, respectively. PBS KIDS outperformed Disney, Disney Jr., Nickelodeon and Nick Jr., in direct comparisons regarding a range of key areas, helping prepare children for success in school, including modeling positive social and emotional behaviors for children, innovation and more. 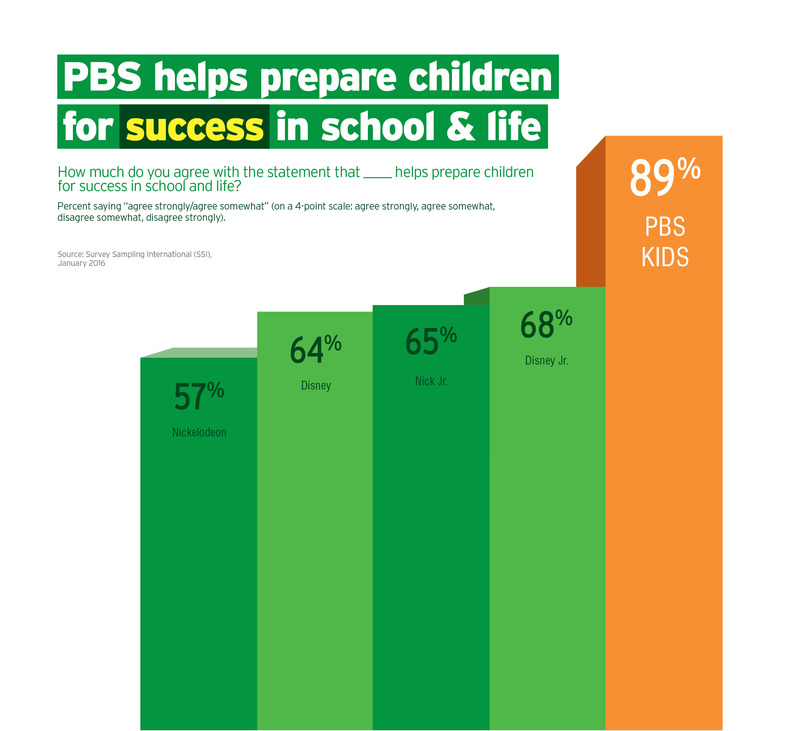 - Eighty-nine percent (89%) agreed “strongly or somewhat” that PBS “helps prepare children for success in school and life.” Disney and Disney Jr. received this rating from 64% and 68% of respondents, respectively. The statement was attributed to Nickelodeon and Nick Jr. by 57% and 65% of participants, respectively. 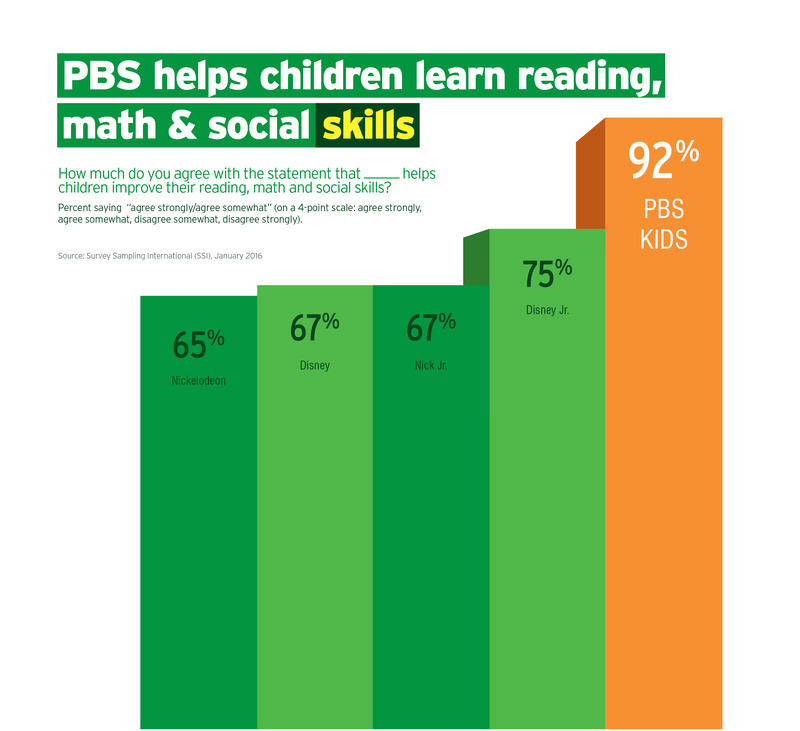 - More than 9 in 10 respondents (92%) agreed “strongly or somewhat” that PBS “helps children learn reading, math and social skills.” Disney (67%), Disney Jr. (75%); Nickelodeon (65%), Nick Jr. (67%). 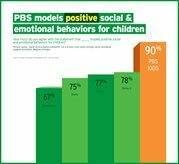 - Ninety percent (90%) agreed “strongly or somewhat” that “PBS models positive social and emotional behaviors for children.” Disney (75%), Disney Jr. (78%); Nickelodeon (67%), Nick Jr. (77%). 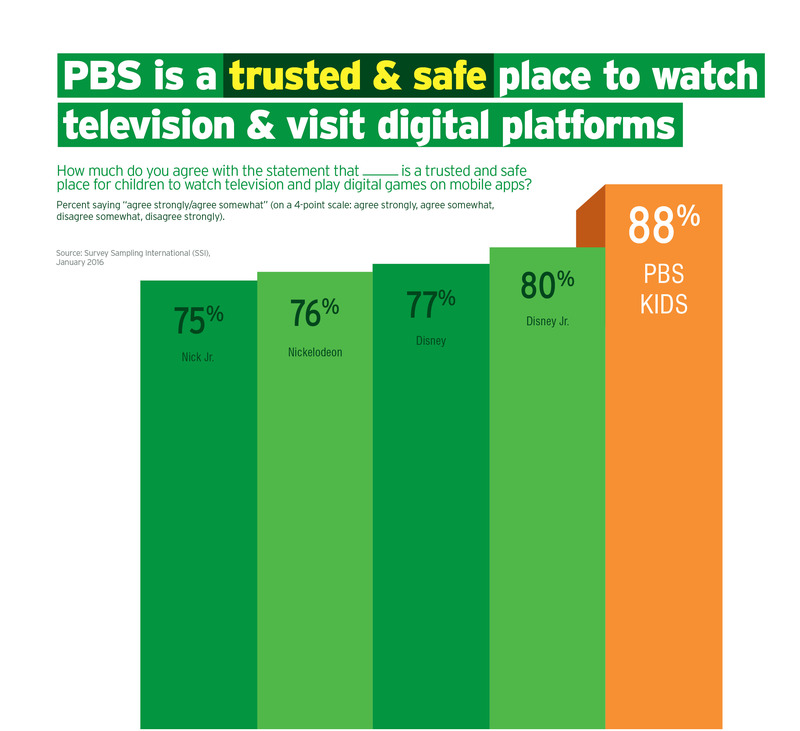 - Nearly 9 in 10 participants (88%) agreed “strongly or somewhat” that PBS “is a trusted and safe place for children to watch television and visit digital platforms,” Disney (77%), Disney Jr. (80%); Nickelodeon (76%), Nick Jr. (75%). 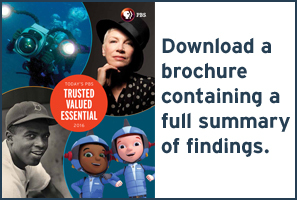 - Eighty-six percent (86%) agreed “strongly or somewhat” that PBS KIDS “is a leading innovator in educational media.” Disney (67%), Disney Jr. (70%); Nickelodeon (60%), Nick Jr. (61%). Additional results are available at http://to.pbs.org/most_trusted_2016. This survey was developed by PBS and conducted by phone within the United States by Survey Sampling International (SSI) on behalf of PBS. The poll was fielded from January 4-20, 2016 among 1,000 adults ages 18 and older. The sample included 500 landline and 500 cell phones, and consisted of 517 men and 483 women. Survey results are weighted to be statistically representative of the U.S. adult population. 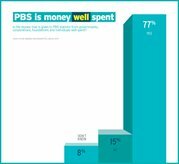 For complete survey methodology, please contact Jan McNamara, PBS Corporate Communications, jmcnamara@pbs.org or 703-739-5028. SSI is the premier global provider of data solutions and technology to drive business success. Over 2,500 companies worldwide trust SSI to power the insights that grow their business. As the premier global provider of data solutions and technology for consumer and business-to-business survey research, SSI reaches respondents in 100+ countries via Internet, telephone, mobile/wireless and mixed-access offerings. SSI staff operates from 30 offices in 21 countries, offering sample, data collection, CATI, questionnaire design consultation, programming and hosting, online custom reporting and data processing. SSI’s 3,600+ employees serve more than 2,500 clients worldwide.